^ 3.0 3.1 Frank, Robert H.; Bernanke, Ben S. Principles of Macroeconomics 3rd. Boston: McGraw-Hill/Irwin. 2007: 98. ISBN 0-07-319397-6. ^ Commodity Data. US Bureau of Labor Statistics. [2008-11-30]. ^ Cochrane, Willard W. Farm Prices, Myth and Reality: 15. 1958. ^ World Economic Survey 1932–33. League of Nations: 43. ^ Schultz, Stanley K. Crashing Hopes: The Great Depression. American History 102: Civil War to the Present. University of Wisconsin–Madison. 1999 [2008-03-13]. （原始内容存档于2008-03-23）. ^ 1998/99 Prognosis Based Upon 1929 Market Autopsy. Gold Eagle. [2008-05-22]. （原始内容存档于2008-05-17）. ^ Hamilton, James. Monetary Factors in the Great Depression. Journal of Monetary Economics. 1987, 19 (2): 145–169. doi:10.1016/0304-3932(87)90045-6. ^ Klein, Lawrence R. The Keynesian Revolution. New York: Macmillan: 56–58, 169, 177–79. 1947. ; Rosenof, Theodore. Economics in the Long Run: New Deal Theorists and Their Legacies, 1933–1993. Chapel Hill: University of North Carolina Press. 1997. ISBN 0-8078-2315-5. ^ The World in Depression. Mount Holyoke College. [2008-05-22]. （原始内容存档于2008-03-10）. ^ 17.0 17.1 17.2 Fisher, Irving. The Debt-Deflation Theory of Great Depressions. Econometrica (The Econometric Society). October 1933, 1 (4): 337–357. JSTOR 1907327. doi:10.2307/1907327. ^ 19.0 19.1 19.2 Bank Failures. Living History Farm. [2008-05-22]. （原始内容存档于2009-02-19）. ^ Bernanke, Ben S. Essays on the Great Depression. Princeton University Press. 2000: 7. ISBN 0-691-01698-4. ^ Bernanke: Federal Reserve caused Great Depression. WorldNetDaily. [2008-03-21]. ^ A Monetary History of the United States. ^ Krugman, Paul. Who Was Milton Friedman?. The New York Review of Books. 2007-02-15 [2008-05-22]. ^ Griffin, G. Edward. The Creature from Jekyll Island: A Second Look at the Federal Reserve. American Media (publisher). 2002. ISBN 978-0-912986-39-5. ^ Kehoe, Timothy J.; Prescott, Edward C. Great Depressions of the Twentieth Century. Federal Reserve Bank of Minneapolis. 2007. ^ 28.0 28.1 Murray Rothbard, America's Great Depression（Ludwig von Mises Institute, 2000）, pp. 159–163. ^ For Hayek's view, see Diego Pizano, Conversations with Great Economists: Friedrich A. Hayek, John Hicks, Nicholas Kaldor, Leonid V. Kantorovich, Joan Robinson, Paul A.Samuelson, Jan Tinbergen（Jorge Pinto Books, 2009）. For Rothbard's view, see Murray Rothbard, A History of Money and Banking in the United States（Ludwig von Mises Institute）, pp. 293–294. ^ Allgoewer, Elisabeth. Underconsumption theories and Keynesian economics. Interpretations of the Great Depression (PDF). Discussion paper no. 2002–14. May 2002. ^ Romer, Christina D., "What Ended the Great Depression", Journal of Economic History, December 1992, vol. 52, no. 4, pp. 757–784 存档副本 (PDF). [2013-01-08]. （原始内容 (PDF)存档于2013-01-17）. "monetary development were crucial to the recovery implies that self-correction played little role in the growth of real output"
^ Ben S. Bernanke, "The Macroeconomics of the Great Depression: A Comparative Approach," Journal of Money, Credit, and Banking 27, No. 1（February 1995）: 1–28. Fraser.stlouisfed.org. [2010-09-04]. ^ International data from Maddison, Angus. Historical Statistics for the World Economy: 1–2003 AD. [永久失效連結]. Gold dates culled from historical sources, principally Eichengreen, Barry. Golden Fetters: The Gold Standard and the Great Depression, 1919–1939. New York: Oxford University Press. 1992. ISBN 0-19-506431-3. ^ Bordo, Michael D. Gold Standard. (编) David R. Henderson. Concise Encyclopedia of Economics 2nd. Indianapolis: Library of Economics and Liberty. 2008. ISBN 978-0865976658. OCLC 237794267. ^ Eichengreen, Barry. Golden Fetters: The Gold Standard and the Great Depression, 1919–1939. New York: Oxford University Press. 1992. ISBN 0-19-506431-3. ^ Bernanke, Ben. Remarks by Governor Ben S. Bernanke: Money, Gold and the Great Depression. At the H. Parker Willis Lecture in Economic Policy, Washington and Lee University, Lexington, Virginia. 2004-03-02. ^ Referring to the effect of World War II spending on the economy, economist John Kenneth Galbraith said, "One could not have had a better demonstration of the Keynesian ideas." Daniel Yergin, William Cran (writers / producer). Commanding Heights, see chapter 6 video or transcript (TV documentary). US: PBS. 2002. 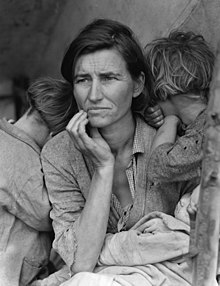 ^ Romer, Christina D. What Ended the Great Depression?. Journal of Economic History. 1992, 52 (4): 757–784. doi:10.1017/S002205070001189X. fiscal policy was of little consequence even as late as 1942, suggests an interesting twist on the usual view that World War II caused, or at least accelerated, the recovery from the Great Depression. ^ Depression & WWII 互联网档案馆的存檔，存档日期2009-06-25.. Americaslibrary.gov. ^ Weimar Republic and the Great Depression. 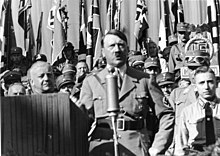 Historylearningsite.co.uk. [2010-09-04]. ^ Myung Soo Cha, "Did Takahashi Korekiyo Rescue Japan from the Great Depression? ", The Journal of Economic History 63, No. 1（Mar 2003）: 127–44. 《改變世界的一百事件》. 明天國際圖書. 2006年6月. ISBN 986-7256-98-0. Bernanke, Ben. Macroeconomics of the Great Depression : A comparative approach [在大蕭條的宏觀經濟學：比較的方法] 27 (1). Blackwell Publishing: 1–28. 1995. JSTOR 2077848. doi:10.2307/2077848. Madsen, Jakob B. "在大蕭條期間的貿易壁壘和世界貿易的崩潰", 南方經濟日報, Southern Economic Journal 2001, 67 (4), 848–868 online at JSTOR. Donald Markwell, 約翰·梅納德·凱恩斯與國際關係：“戰爭與和平”的經濟路徑, Oxford University Press (2006). Tausch, Arno, with Christian Ghymers. "從“華盛頓”向“維也納共識"?全球化，發展和全球治理的定量分析". Hauppauge, N.Y.: Nova Science Publishers, 2007. Tausch, Arno and Almas Heshmati（Eds.）"班加羅爾的路線圖？全球化，歐盟的里斯本進程和全球不平等的結構" Hauppauge, N.Y.: Nova Science Publishers, 2008, with contributions by Franco Modigliani et al..
Taylor, David A. 靈魂的人物：WPA作家的項目揭示美國大蕭條. Hoboken, N.J.: Wiley & Sons, 2009.